First, go look at a new post-dated post for September 21. I was supposed to put it up but I forgotted. It’s part of Ren Garcia’s blog book tour! The marvelous Dan Antion inspired me to join Norm Frampton’s Thursday Doors link-up this week. I have the doors for it! Last Saturday, I joined around 100 other authors for the first-ever Kentuckiana Authors Book Blitz at The Louisville Palace theater in Louisville, Kentucky. The Palace began life as a picture palace in 1928 as Loew’s and then United Artists. Designed by obviously deranged architect John Eberson, it was and is a riot of baroque rococo superfluity. It’s been restored to its original opulence, and now serves as a live theater and event venue. We were in the “Faces Lobby”, so called because the vaulted ceiling is covered with carvings of famous guys like Shakespeare, Beethoven, Dante, and that kind of crowd. It was very dark in there, with atmospheric lighting, so most of my pictures didn’t come out. Here’s one of the door to the office. Just an ol’ office door, like it ain’t no thang. 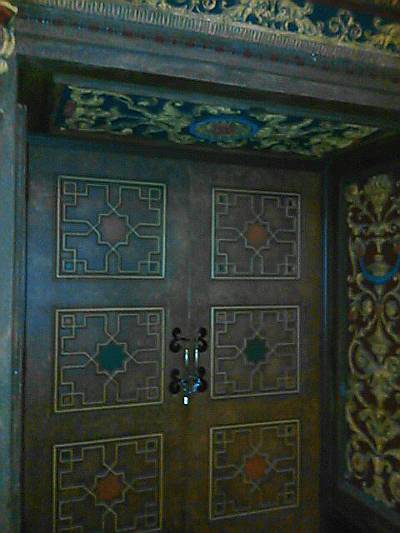 And these are doors into the theater seating. I’m telling you, the damn place is GORGEOUS! These pictures don’t even scratch the surface. If you ever do a Louisville trip, see about getting tickets to a show at the Palace. It’ll be worth the price of admission just to wander around. A WRITING PROMPT FOR YOU: Write about something that’s so over-the-top it goes all the way through tastelessness and comes out the other side. 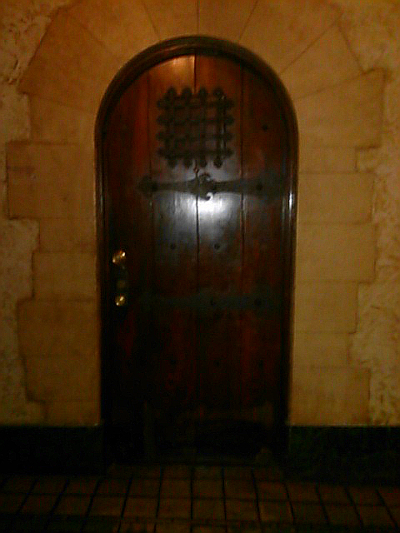 This entry was posted in Photos, Thursday Doors. Tagged architecture, doors, Kentucky, Louisville, old theaters. The Palace is indeed a miracle. Reminds me of having dinner with Somtow at the old Levy’s building (was it called the Spaghetti Factory then?). Anyhow, from the high ceilings were suspended a riot of chandeliers (none matching), and a trolley car sat in the middle, made up with booths and tables, etc., for customers to dine in. Plus the usual Victorian exuberance of the old place, itself. It was lit up like Levy’s. These are wonderful! If I’m ever in Louisville I will certainly look this place up. I knew I’d never be able to capture the auditorium. It’s magical! Those are indeed beautiful doors Marian! Thanks for joining us today. I particularly like the first one with the arched top and the gorgeous hardware. @Dan – Ack, I pushed send before thanking you for the mention – I appreciate that! I like that old office door. Me, too! I love the stones outlining it. Marian, your choice is yet another reason I love the old, renovated buildings, theaters often being prime examples.